Kuwait Airways Monday signed on the dotted line for the purchase of eight of France-based Airbus’s 330neos as the national carrier embarks on the overhaul of its fleet. The agreement was signed in Toulouse, the headquarters of the aircraft manufacturer. The new fleet will be delivered next year, Trade Arabia reports. The agreement, according to Kuwait Airways chairman, Yousef Al-Jassim, aligns with the airline’s fleet expansion and growth plans. “We are confident that the A330-800 will support us to compete effectively on our expanding route network. Our relationship with Airbus extends beyond aircraft acquisitions and we look forward to further collaboration on technical fields,” Jassim said at the signing ceremony. The carrier has already A350 XWB and A320neo Family aircraft on order. 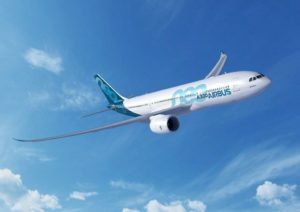 A330neo is Airbus’s new generation, introduced in 2014. The A330neo aircraft are powered by Rolls-Royce’s latest-generation Trent 7000 engines and known for being fuel efficient, 25 per cent lower per seat. A330neo Family is very popular among other competitors. Some 120 customers have placed 1,700 orders and 1,400 A330s are in operation by over 120 operators worldwide. Written by: Jaber Ali on October 16, 2018. Posted by Jaber Ali on Oct 16 2018. Filed under Gulf News, Headlines. You can follow any responses to this entry through the RSS 2.0. Both comments and pings are currently closed.